Welcome to Lake Powell Houseboat Rentals! Lake Powell is arguably the most stunningly beautiful houseboat destination in the country. If you’ve never taken a houseboat vacation on Lake Powell, on the border of Southern Utah and northern Arizona, you don’t know what you’re missing. This winding lake has nearly 2,000 miles of coastline in some of the most gorgeous landscapes in the country. If you imagine sailing through the Grand Canyon—which is just downstream—you’ll get a good idea of what Lake Powell houseboating is like. 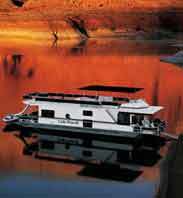 Lake Powell Houseboat Rentals can help you plan a trip leaving from Wahweap, Bullfrog or Antelope Point marinas. We have a boat just right for your group, from the inexpensive 46-foot Expedition, a perennial favorite, to the luxury 75-foot Silver Xtreme with all the trimmings. We can also outfit you with a full selection of water toys, power boats, and personal watercraft for your houseboat vacation. We pride ourselves on our commitment to working with our customers to help make their trip the best it can be. Give us a call today and let’s start planning your dream Lake Powell houseboat vacation! We’ve got great specials on houseboat trips year-round! Our specials let you and your group get more for your vacation budget. Please visit our official website to check out our great deals, or give us a call toll-free at 888-454-8825.